An Accredited Staging Professional is a dedicated professional who has studied and learned the proven and powerful techniques of staging homes. The ASP designation is the largest Home Staging training and accreditation company in the world, and is the most widely used and recognized home staging credential. Barb Schwarz is the creator of Home Staging, a best selling author and the founder and CEO of StagedHomes.com. 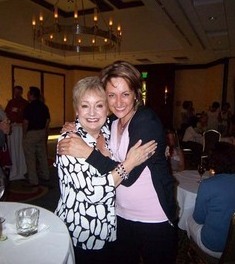 She is pictured here with Katie Matthewman, owner of Fine Redesign at the ASP-IAHSP Convention in Bellevue, Washington in 2008.